Christmas ornaments can be made many different ways. The ones pictured here are very different and are easy to make. There are many different crafts that you can make for your tree. It is always nice to have handmade ornaments that you can use for years and years. The great thing about these balls is that they will be handed down from generation to generation. These ornaments take a little time but they are well worth it. 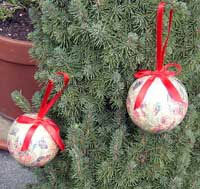 There are many different ways to make Christmas balls and they all look beautiful. The ornaments pictured here were done with Angel napkins but you can get all kids of designs in napkins. They do have some beautiful Christmas designs. To use glue for this ornament you need to dilute it with water. I prefer to use mod podge because it is easy to work with. Tear your napkin to the designs that you want to use. Donâ€™t cut them. The tissue blends in a lot better if you tear it first. Brush some glue or mod podge to half of the glass ball and apply the design. Work the wrinkles out as you go. Turn and do the other side. This gets your hands missy but it washes off real easy. Apply another coat of the mod podge and hand it up to dry. Coat hangers work great for this step as you can get a few on the hanger at a time. When they are all dry attach a ribbon to the top hanger and add a bow. You may want to make a bunch of different designs and give them as gifts. Your Christmas ornaments are now finished and ready to hang. You can make them to match your tree decor or build your decor around your ornaments.